If you’ve got a Fitbit, and you use an iPhone, there’s a good chance you’d like to sync the stats from your Fitbit with the Apple Health app you’ve heard so much about. 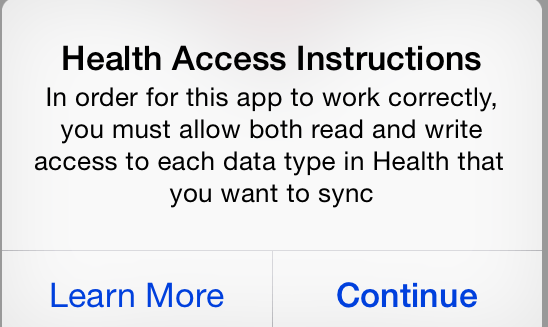 There’s one well-known problem: Fitbit (see disclosure) doesn’t let its data sync with Apple Health. In fact, Apple Stores don’t sell Fitbit trackers anymore. But Apple Health integration is one of the most requested features on the Fitbit Forums — clearly, there is a large number of people who would love to use their Fitbit hardware with Apple software. Why would you want to use Apple Heath? That’s a good question! The Fitbit app and websites are pretty solid. The main reason you’d probably want to employ this workaround is that you’re planning to purchase an Apple Watch when it launches sometime in early 2014 and you’d like a bit of continuity to your health stats. You might also prefer Apple’s interface to Fitbit’s. You might also argue that if you own a Fitbit, you should own the data — not simply the ability to access Fitbit’s line of services. You’ll need a $1.99 app called Sync Solver. You probably already have the Fitbit app on your iPhone. From there, it’s straightforward. First, sync the Fitbit app with your Fitbit tracker to get your data into the system. Then, open up Sync Solver. It will prompt you to import the data from your Fitbit app by logging in, and it will automatically sync it with the Apple Health app. You need to approve both read and write privileges on the Sync Solver app. Sync Solver can help import steps, distance, sleep analysis, active calories burned, and weight from Fitbit. 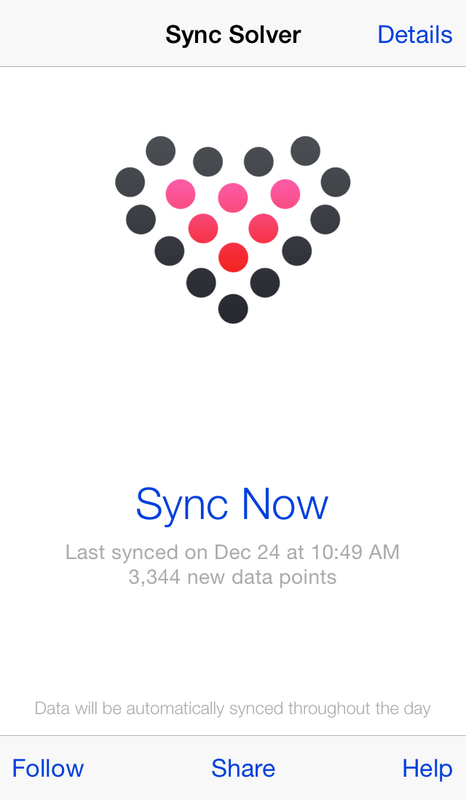 One quirk is that the imported data in the Health app will have a Sync Solver icon next to it, as opposed to the Fitbit logo, but I haven’t noticed any problems with accuracy or missing entries. Sync Solver isn’t perfect — it doesn’t have access to Fitbit’s Partner API, so it can’t do intraday syncing, and it’s unlikely to gain that ability because some of its features, like data exportation, compete directly with Fitbit’s premium subscriptions. There are a few other apps for iOS specifically designed to bridge Fitbit and Apple Health. One is called Wristband Manager, but it doesn’t have nearly as many reviews as Sync Solver and it also costs $1.99. SyncFit promises to do the same thing for $0.99, but the reviews say it doesn’t work. Unfortunately, you can’t use a free app like My Fitness Pal as an Apple Health intermediary. It would seem as if you could — My Fitness Pal can receive data from a [company]Fitbit[/company], and it can also interface with Apple Health. 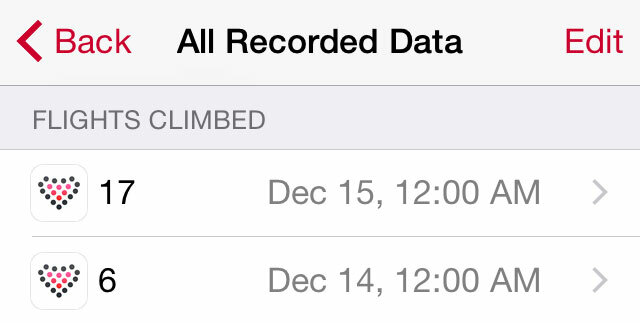 But the problem is that it won’t sync steps or miles logged to Apple Health. Some people, however, have reported that if you’ve got the Fitbit Aria scale, it’s possible to import that weight data into Apple Health through My Fitness Pal. The most common problem that users face is that their steps are double counted. Because Health can use a newer iPhone as a step counter, sometimes when using a workaround [company]Apple[/company] Health will count both the steps from both the FitBit and your iPhone. 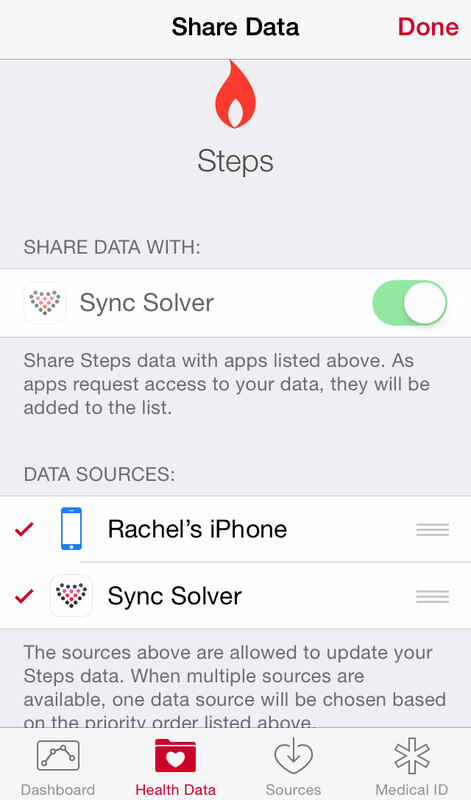 To fix this, navigate to Health Data > Fitness > Steps > Share Data in the Health App. In the corner, tap Edit and move Sync Solver up to the top of the list of Data Sources — which will prioritize it over the steps read by your iPhone. Finally, you have to sync manually or on a daily basis using these types of workarounds. It’s because these apps don’t have official Partner access to Fitbit’s API, and that’s unlikely to ever be granted because Fitbit not syncing with Apple Health is a business decision, not an oversight. Sometimes, it’s just not worth the effort to bend a product into working a way it wasn’t designed to work. It might be silly that Fitbit can’t sync with Apple Health (or Google Fit) but there are several trackers that do work with both. Jawbone’s UP line of wristbands can sync with Apple Health, and so can the Misfit Flash or Shine. And finally, Fitbit’s software is pretty great and might be a better fit for you than Apple Health is at the moment. Fitbit’s app presents information in a way that’s easy to understand, and it’s got features for challenging you and helping you keep up with friends. And if none of these workarounds work for you, the Apple Watch will be out before long, and that’s guaranteed to work well with Apple Health. “Thatâ€™s a good question! The Fitbit app and websites are pretty solid.” No, the app (especially on iOS) is buggy as hell, and each new release significantly breaks something. The app and web interfaces suffer from discrepancies in nomenclature and the math underneath rarely agrees. A true Apple integration would be welcomed.